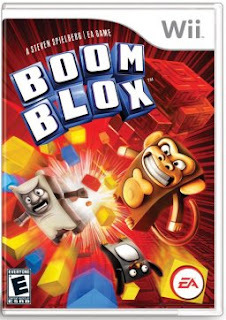 Boom Blox is everything that a third party title for the Wii should be.Instead of a poorly thrown together collection of minigames, or another port with motion control grafted on, this title shows a rare level of polish and craftsmanship that you normally donât see outside of Nintendoâs first party titles.Itâs a game that completely embraces the family-friendly idea the Wii is centered around and is something that gamers of all skill levels can enjoy. The concept of building up blocks only to knock them down again is one Iâm sure weâve all explored as a child.The beauty here is that, while also being less messy, Electronic Arts and Steven Spielberg have managed to take this most basic idea and expand upon it in a variety of both interesting and challenging ways. Who would have thought there were so many ways to knock down a tower of blocks? You'll start out by simply throwing a ball and seeing how many points you can score, but the game does so much to mix up this formula.In some cases youâll have special types of blocks, including ones that vanish when you hit them and others that explode.Other times youâll be carefully sliding out blocks while trying not to damage the overall structure, a la Jenga.Once you get a handle on the basics youâll find yourself setting up and setting off chain reactions of exploding blocks, or sniping blocks out of midair once the tower beings to fall. All of these game types, and several others, are introduced gradually though the gameâs story and challenge modes.The bronze, silver, and gold medals that you can earn for each challenge allow for a large margin of error and help to ensure that youâll never find yourself stuck on one level for too long.And when you complete a challenge, the game usually has a reward for you in the form of an item or character to use in the gameâs level editor mode. All together, Boom Blox simply encapsulates the Wiiâs gaming philosophy to a tee.It is able to appeal to as wide a demographic as the console reaches, it utilizes the motion controls in such a way that actually enhance the gaming experience, and the rewards and varying degrees of success provide a constant incentive to keep playing.Who would have thought that all of this would come from the odd game-making couple of EA and Spielberg? The gameâs one big drawback steams from its lack of a true online component.The level editor, being as accessible as it is, will surely produce some interesting levels from the community - but youâll never know that unless youâve got a team of Boom Blox specialist on your friends list.Not having an overarching data base where you can go to rate and download other peopleâs levels is just wasted potential that would have easily extended this gameâs life even further.Online issues aside, Boom Blox is a delightful and engaging game that definitely warrants your attention. More Mass Effect DLC on the way?